There were 5 Galleys onboard: the Main Galley for the Junior and Senior Rates, the Wardroom Galley for the Officers, the Bakery which made all the bread and other goodies, and the Air Crew Refreshment Bar (ACRB). The Captain had his own personal chef and galley. 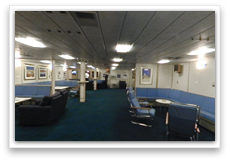 The Main Galley employed 1 PO Caterer, 4 Leading Chefs, and 12 Chefs. It was able to produce over 1000 meals 4 times per day. 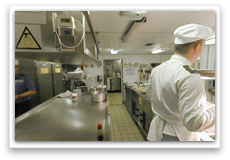 The Wardroom Galley employed 1 PO Chef, 4 Leading Chefs and 4 Chefs. It was able to produce up to 200 meals 4 times per day. The Bakery employed 1 PO Caterer, 1 Leading Chef and 2 Chefs. The Bakery had the capability of producing over 1500 breakfast rolls, more than 100 loaves of bread and making an assortment of hot and cold desserts. The Captain's Galley was small in relation to the others. The Captain's personal chef took care of the day to day requirements of the Captain and any official entertainment that may be required. The ACRB (Air Crew Refreshment Bar) was manned by 2 Chefs and provided snack type meals for pilots and aircrew 24 hours a day whilst operational. On an average day the ship's crew could consume some - 900 eggs, 625 Kg of potatoes, 50 loaves, 400 rolls, 160 litres of milk; and over 1.5 tonnes of meat per week. What makes a naval galley unique? Quite simply the STAFF. A happy galley leads itself to good food and good food at sea leads to good moral and a happy Ship's Company. After all. a ship sails on its stomach. 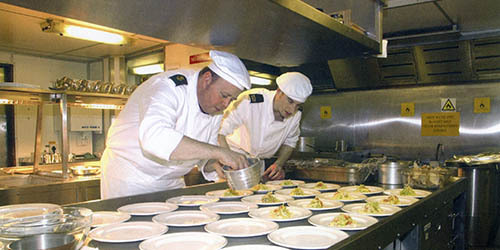 The galley has to be able to withstand a force 12 gale and still produce a meal for the Ship's Company. The movement of the ship in these conditions makes the job even more difficult. The ship held approximately 30,000 items in 14 storerooms and in the hanger. Departments also held their own stocks. The Stores Organisation supported the Air, Air Engineering, Marine Engineering, Weapons Engineering, Medical, Warfare and Executive branches and the Embarked Squadrons. These departments generated an additional 20,000 demands per year. Stock ranged from pencils to spare Olympus Gas Turbine Engines, from black socks to laser guided bombs for the Harriers. Replenishment was varied. RAS (Replenishment at Sea) with a RFA (Royal Fleet Auxiliary) ship was practiced with loads transferred by Vertrep (Vertical Replenishment i.e. helicopter) and Jackstay (a wire suspended between the 2 ships). Arrival alongside could generate between 20 - 30 pallets of stores ready for collection. 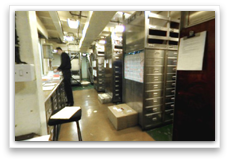 The Ship's Company records were maintained and administered by the Writers and Officers of the Unit Personnel Office (UPO). Everything from pay to promotion, and education to resettlement, at all ranks and rates here and in the Captain's Office. 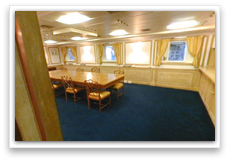 Up to 207 Officers of mixed rank and gender could be accommodated in Ark Royal's Wardroom. They were looked after by a team of Stewards consisting of 1 CPOSTD, 4 POSTDs, 8 LSTDs and 28 STDs. The Captain was looked after by his personal LSTD.